I didn’t think I would like this volume at first as it begins with a lengthy Teenage Mutant Ninja Turtles appearance and I personally detest crossovers. Even though the TMNT are animals they are from the human world of the readers and their humour and character is completely at odds with the traditional world of Usagi. At one point they further destroy the frail reality by speculating how Usagi and his fellow animals “evolved” into people and come up with other similar anachronisms. This is a shame as the story they inhabit is an important one dealing with one of the Ninja clan making trouble for Usagi. The other stories are excellent and feature some very bold storytelling. There is one concerning a pack of tokage lizards. 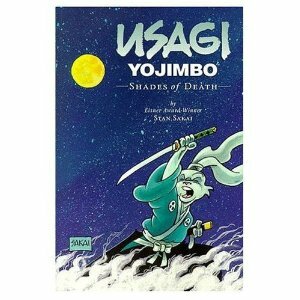 Although it features Usagi and others there is no dialogue just the “eep” of the lizards. It is testament to the writing and artistry that you still follow exactly what is happening even without speech. The art is good and there are a number of little touches where the art shines. Such as art leaving one panel and crossing into the next, different styles for flashbacks and narrated passages, clever inverted white on black for thunder flashes and so on. These things are easily overlooked but make a real difference. There is one story that is told from the point of view of a roadside shrine. It consists of several pages that feature exactly the same panel. The viewer’s eye is fixed on the same vista and we only see what passes through that vista. Yet we see Usagi doing what he does best and learn all about Jizo the divine protector of children. Despite the rocky start this turns into a distinct Thumbs Up! This entry was posted in Graphic Novel and tagged Stan Sakai, Thumbs Up! by 365gn. Bookmark the permalink.